Dedicated Setups of UniPunch tooling. 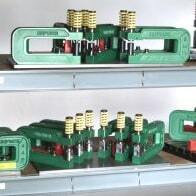 UniPunch “A” series holders up to 2” wide feature economical two-piece punches. The punch heads and bodies are separate which lets you quickly change hole size or shape by simply changing the inexpensive punch body and the die. The unique slip-on retainer pin holds the punch in place without any special tools. You can use and reuse the punch heads indefinitely. Low-cost die buttons complete the punch system and offer close tolerances for accuracy and interchangeability.